Brush your fur to remove the dirt. After brushing it's much easier to make a straight cut. What a set of choppers. 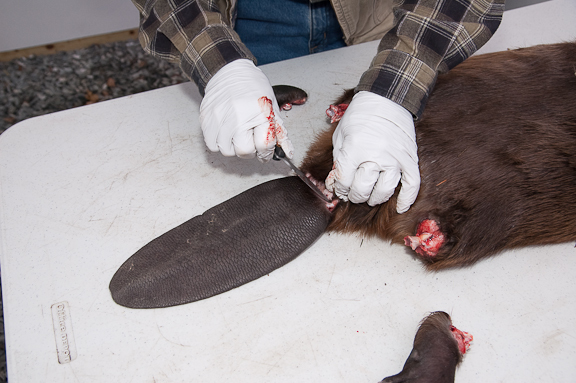 Cut the fur around the leg between the fur and the pad. Bend the palm over and cut through the back of the joint. One front paw is removed, now remove the other..
To remove the rear feet cut the around the leg and slice in back of the heel close to the joint. Twist the foot and if necessary cut through the rest of the Achilles tendon. One rear foot is removed now do the other. Bend the tail toward the belly. 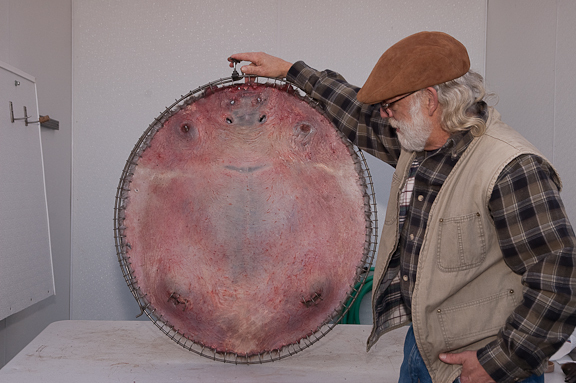 Then make a slice all the way around between the tail and the hide. Be careful not to cut too deep. Begin at the lower lip and cut a straight line to the vent. Be careful, you don't want to cut through the fat into the stomach. Cut around each side of the vent and continue to the tail. 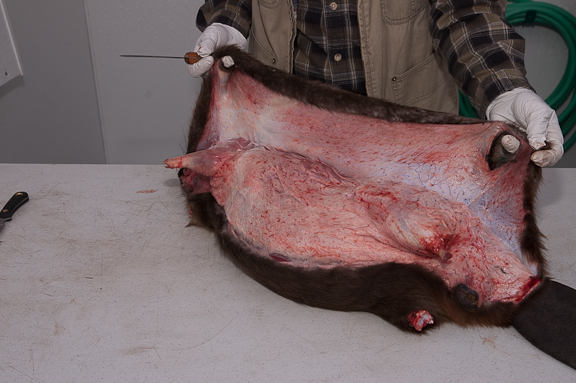 Now you're ready to begin skinning. 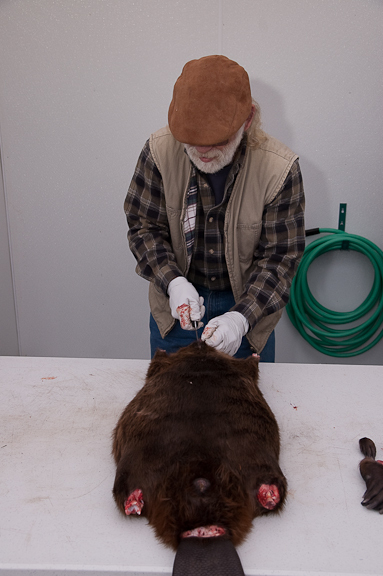 Start at the head and begin separating your pelt from the carcass with your skinning knife. Keep your blade flat against the carcass. 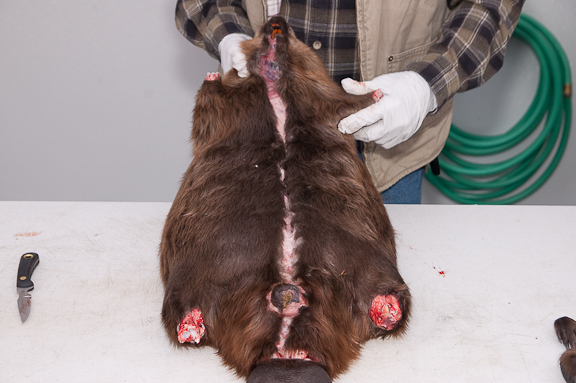 Be gentle going around the legs, the pelt is thinner there. 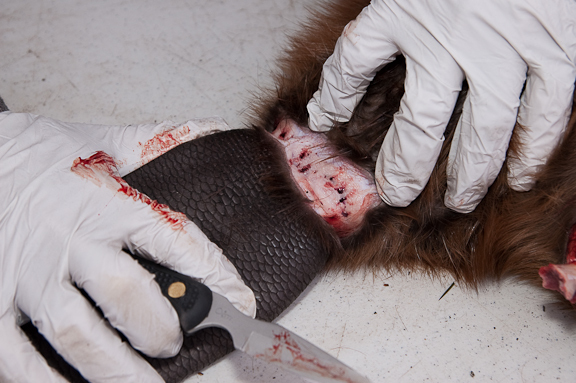 You always keep some tension on the pelt as you're skinning. This small black spot is an oil gland. It should be left on the pelt. 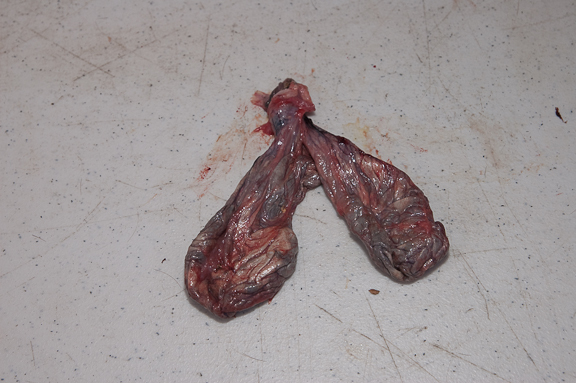 You can see the gland near the fur line. 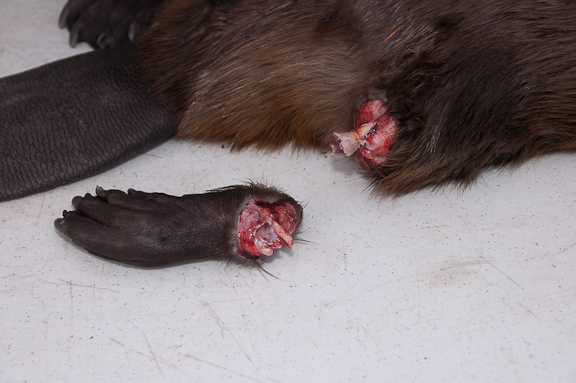 The fur is very thin around the rear leg, be careful. I'm applying light pressure with just the edge of the skinning knife. 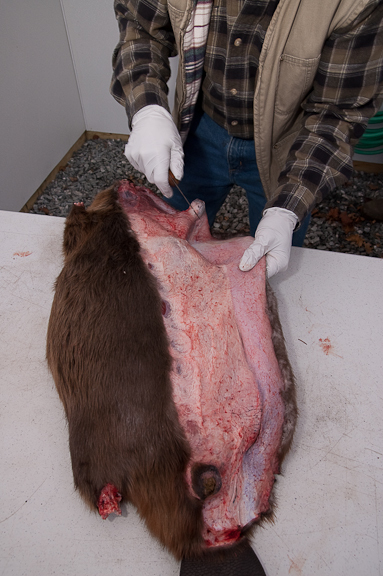 Do the other flank in the same manner and flip the beaver onto it's belly to begin the back. 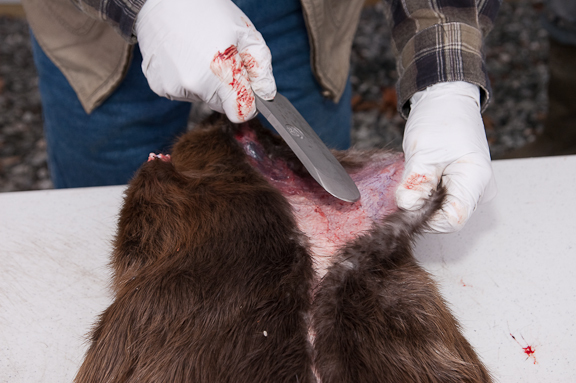 Begin from the tail keeping your skinning knife fairly flat with the carcass. Skinning the back requires a little different knife technique. 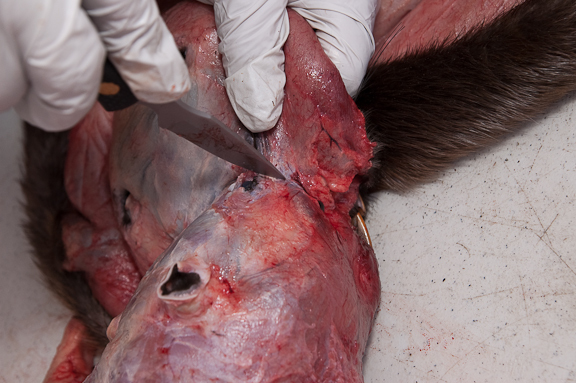 Keep more tension on the fur with your free hand. 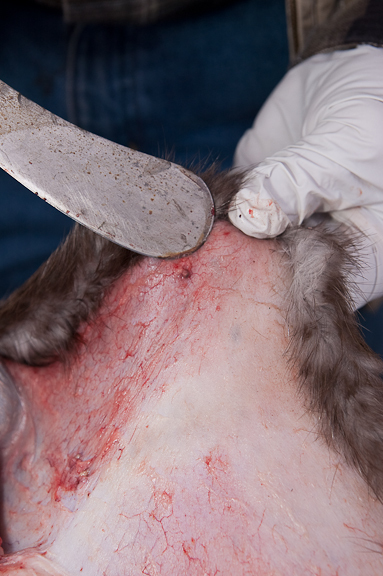 This creates a white line that you follow with the tip of your knife to free the fur. 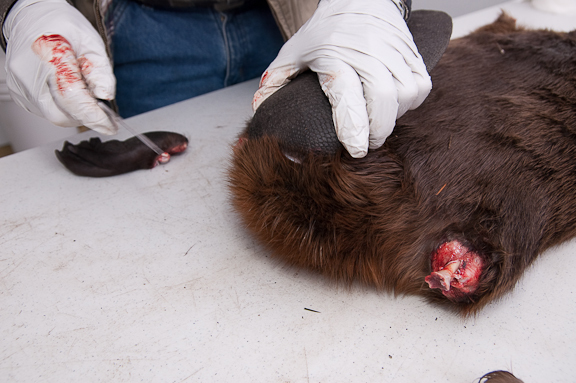 Cut around the ear until it is fully exposed. You'll be able to put your thumb through the opening when the ear is fully exposed. 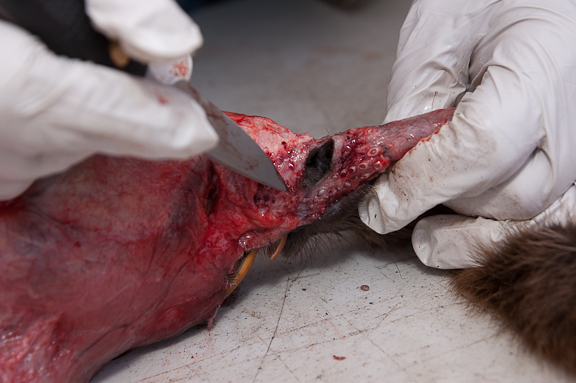 Cut through and remove the ear from the head. Cut around the eye always feeling for the skull with the tip of your knife. 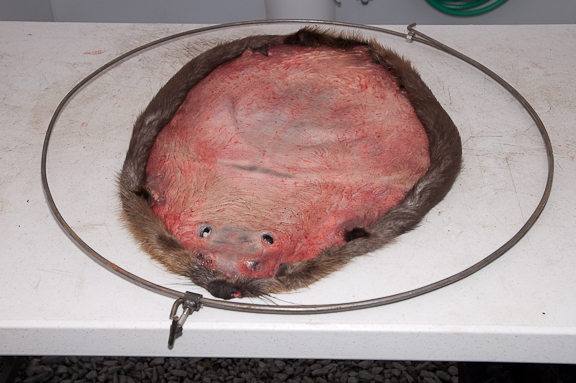 The fur is now removed around the ears and eyes. 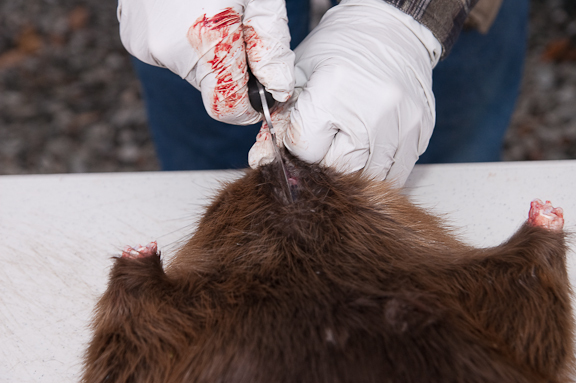 Cut the whiskers close to the pelt. 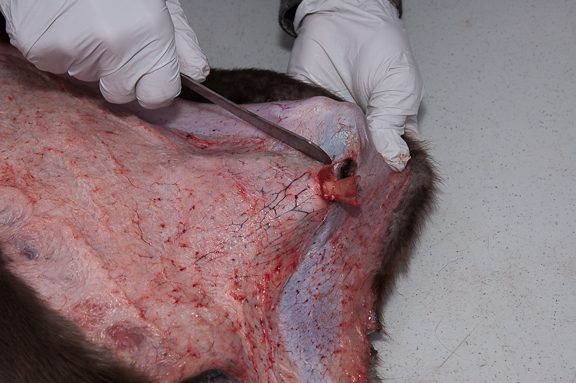 Final cut to release the pelt from the nose. Feel on the head side of the vent and locate the castors. Make a horizontal slit to expose them. They are in a thin, clear sack that you should be able to remove still connected together. These are the castors, not a very nice set though. 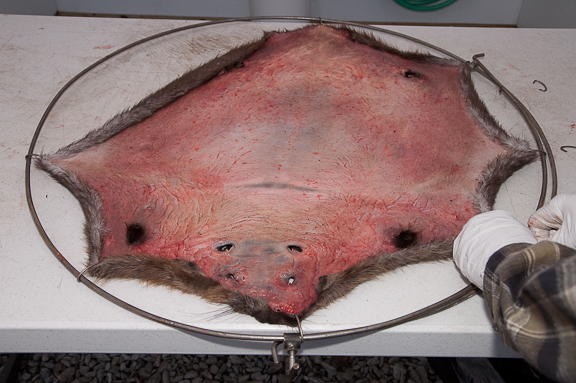 Adjust the size of your hoop stretcher to the pelt size. 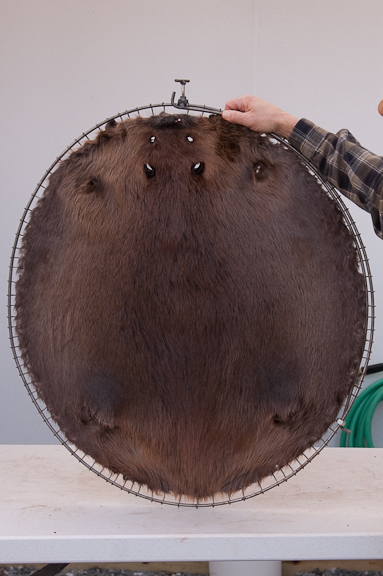 Evenly add your hooks opposite each other around the edge of your pelt. 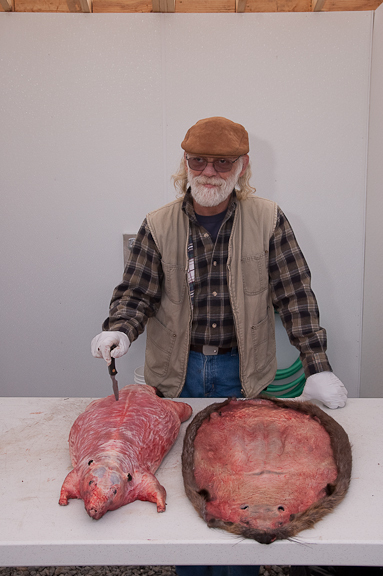 You want to end out with an oval shape slightly longer from nose to tail.